The markets were treated to a clash of titans a couple days ago - not in movie theaters but in the EU summit! The spat between Germany and France, Europe's two largest economies, continued as European leaders talked for almost six hours during an informal dinner. Oddly enough, it wasn't long ago that these two countries were best buds. German Chancellor Angela Merkel and former French President Nicolas Sarkozy saw eye to eye on many issues, and together they formed the so-called "Merkozy" duo - a modern day Batman and Robin! However, this all came to an end when Sarkozy lost the French presidential elections to Francois Hollande. Since then, German-French relations haven't been the same as Merkel and current French President Francois Hollande have failed to agree on many hot economic topics. 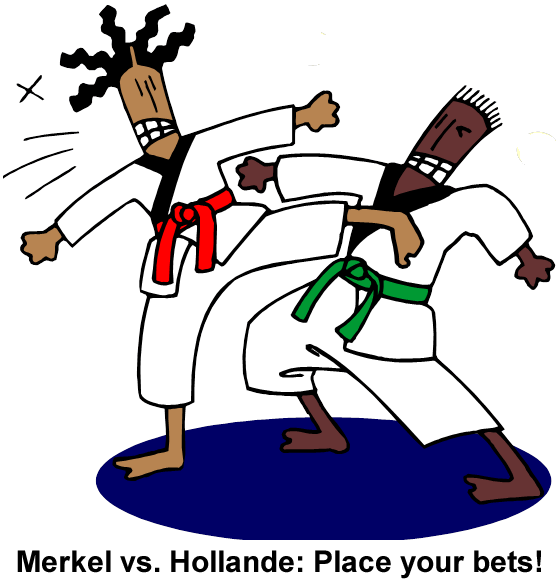 That the Merkel-Hollande duo has been dubbed "Merde" says everything you need to know about their relationship! Merkel is all about budget austerity and structural reform. She wants euro zone countries to focus on austerity measures to meet their budget targets and would like to see "closer cooperation in the euro zone regarding the social welfare system." As for the issue of Eurobonds, Merkel is hotly against it and she has Sweden, Finland, and the Netherlands backing her up! The anti-Eurobonds camp believes that it won't promote growth and that it would only increase their borrowing costs. "Too many countries have got too many loans for too low a price for too long," according to Finnish Prime Minister Jyrki Katainen. Meanwhile, Swedish Prime Minister Fredrik Reinfeldt thinks that Eurobonds would only punish good behavior and reward bad behavior. Francois Hollande, the new kid in the bloc (pun intended), wants more efforts focused on the region's growth. He suggested that though some members don't agree with his sentiments, it's important that leaders start considering economic growth more seriously. Hollande isn't alone in the growth-centered camp, either. Belgian PM Elio Di Rupo is for implementing financial transactions tax, Eurobonds, and other euro projects, saying that they've got to give hope back to the people. Even Irish Prime Minister Enda Kenny is open to the idea of a common bond, saying that such opportunities should be explored. As of the meeting on Wednesday, three pro-growth propositions have gained popularity. First is the issuance of EU-backed "project bonds" that would help fund infrastructure projects. Another is doubling the contributed capital of the European Investment Bank (EIB), EU's co-financing arm, to slightly above 20 billion EUR. Lastly, there are suggestions of redirecting structural funds from poorer euro zone economies to countries that have more growth potential. Unfortunately, some market players believe that the three proposals still won't be enough to give EU economies the urgent boost they need. What we can take away from the opinions mentioned above is that while European leaders are on the same boat on some issues (e.g. their desire to keep Greece in the euro zone and its need to keep its commitments), they have yet to agree on other important points. It doesn't mean that they're far from settling on concrete solutions though. Most of the leaders already believe that both growth and austerity measures are needed. They only differ in what they think should be emphasized. Looks like we'll have to wait till the official EU Summit in June to see who wins this tug-o-war, eh?